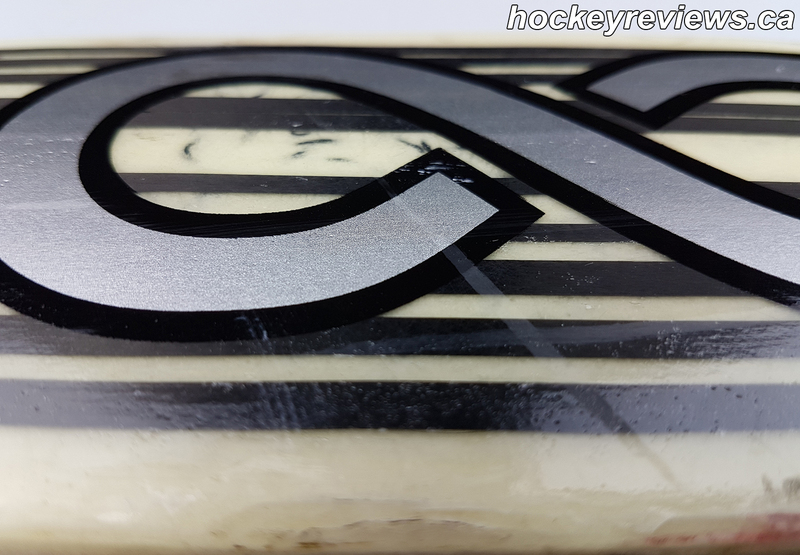 I reached out to Infinity Goalie, which is a branch of Kaleido Sports (they sell jerseys and have made the Reddit r/hockey jerseys in the past), to see if they were interested in working with me to do a review and write up of one of their sticks. Luckily for me John liked the idea and told me to pick one of their in stock sticks and it would be sent out. Their main website is http://www.kaleidosports.com/ and their custom team jersey website is www.JerseysMadeEasy.com. Thank you to Infinity Goalie for sending me this stick to use write a review for. First Impressions: Pulling the stick out of the box it felt lightweight and well balanced when playing with it in my hands. The curve is an aggressive heel curve and I was extremely excited to use it again. Since this is my 1st stick with a shorter shaft length I was curious if it would have a negative effect on my play, or if I would notice the difference at all. Construction: The shaft is made of a aspen and birch laminate. The paddle is a urethane foam core with carbon reinforcements on the shooting side of the stick. Putting the carbon on only the shooting side is said to add more kick to the stick when you shoot and load it. The blade is a urethane foam core with a carbon laminate wear bar on the lower middle portion of the blade. This wear bear is not very visible but you can feel it when you run your fingers along the face of the blade. An additional layer of carbon laminate is wrapped around the blade and finally bus bumper material is woven into the bottom of the blade for even more reinforcement. 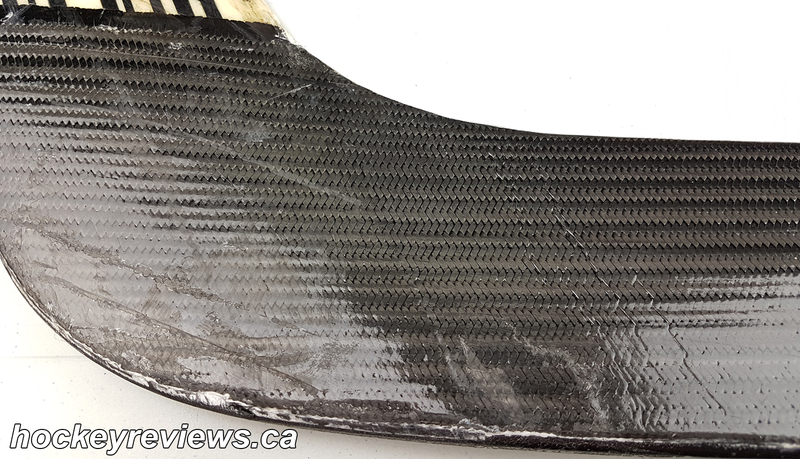 The purpose of the bus bumper material is to stop the foam core from crumbling or splitting at the bottom of the blade (see my How to Fix a Broken Goalie Stick post to see what I am talking about). Shooting: Since I usually buy sticks on clearance it is harder to get the curve and specs that I actually want, with this stick I was able to select my favourite curve and try to reproduce my love for my old Miller curve sticks. The problems I initially had (and sometimes still do) is with the length of the shaft, since my top hand is now lower to the ice I had to adjust puck position (lie) and my shooting motion to compensate for the shorter shaft. This adjustment has caused some issues when I try to quickly get a shot off, I have flubbed shots from having the puck on the wrong part of the blade or from having the blade on an awkward angle on the ice and slipping out when I try and load the stick. This isn’t inherently the sticks fault, but rather my unfamiliarity with it and the fact that I haven’t had the time to really practice shooting and work with the stick since my ice time with the Infinity Exosphere has been late season games, tournaments, and playoffs with no shinny nights or practice time available. I will base this section of the review on how I feel the stick shoots when I do get off a proper shot, because if I had more time with the stick I am confident my shooting would be more consistent. I have found I have been trying to make more cheeky slower saucer passes with the heel curve (like I would as a player) but have found that I don’t have the lower hand control to pull this play off as I can’t grip the stick nearly enough with my catching glove. With that said backhanding with this stick has been much easier compared to my previous ones because of the heel curve and the stiff feeling blade. The curve allows the puck to easily ramp up the back of the stick and raise it allowing me to chip it off the boards and around and above forechecking player’s sticks. When I do get off a good shot I have found that the stick plays very consistent with a stiff blade, which is something I love in player sticks as well. The curve allows me to quickly get the puck off the ice without any effort, the puck simply slide along the blade and raises in the air. With the Infinity Exosphere I have regained my confidence in being able to shoot the puck hard and away from danger. With some sticks I found that I would have to drag the puck into my body before letting off a shot in order to get off a proper shot, with the Exosphere that extra motion isn’t needed and I simply have to load the stick and shoot. I am a stay at home goalie, I don’t venture out of the net much and I do not play very aggressive which translates to me not playing the puck all that often. But, with the Infinity Exosphere I have completed long breakout passes to my team at the red line or opponents blue line trying to force a quick counter attack. While these plays have not resulted in an assist, I blame my team’s lack of scoring ability more so than anything I did wrong (no, not anyone on the Tigers). Durability: I have only used this stick for 2 months, but it was the busiest 2 months of hockey I have ever had averaging more than 3 times per week and was exposed to the highest level of hockey I have ever played. This stick has gone through abuse and hopefully that is visible in the video and in the pictures. Any changes to my comments on durability will be updated in a new post and reflected here as well. Going over my Infinity Exosphere and I can see an array of damage from normal use. My high wear areas of all sticks are the bottom of the blade, the top of the blade which connects with the paddle, the edges of the paddle, and the shaft from contact with the post (for finding my position). I suggest you watch the video to see for yourself. Running my bare hands along the shaft of my goalie sticks is a risky venture, on the majority of sticks this will lead to at least one sliver, that isn’t the case with the Infinity Goalie Exosphere. The Exosphere is still smooth to the touch with the outer gloss coating holding up well, you can feel some dents along the faces of the shaft where pucks have impacted, but there are no cracks to be found and the dents haven’t punctured the outer coating exposing the inner aspen and birch laminate. Along the edges you can certainly see and feel more damage, along the inside edge of the shaft you can see the red paint transfer from my constant post taps. 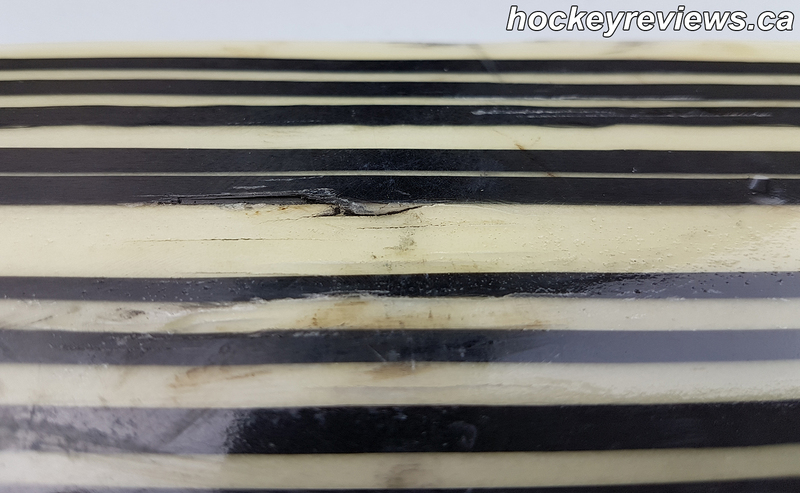 On front edges you can see the black puck marks and dents from those lucky shaft saves (I mean I totally meant to stop the puck with the tiny shaft and not my blocker!). Again with the dents on the edges there is still no splitting of inner materials and the gloss coating has held everything together very nicely. The paddle of the shaft definitely shows some wear, with some significant dents along the front face and the edges. I can still run my fingers along the face and edges of the paddle without getting them caught up on wood or the inner foam core (so no splinters), but I can feel areas where the urethane core feels exposed and there is a crack in the outer face coating next to a significant dent. I believe when talking about the paddle the important part is that there is no evidence of any paddle delamination and I am happy with the Infinity Exosphere paddle has held up so far. 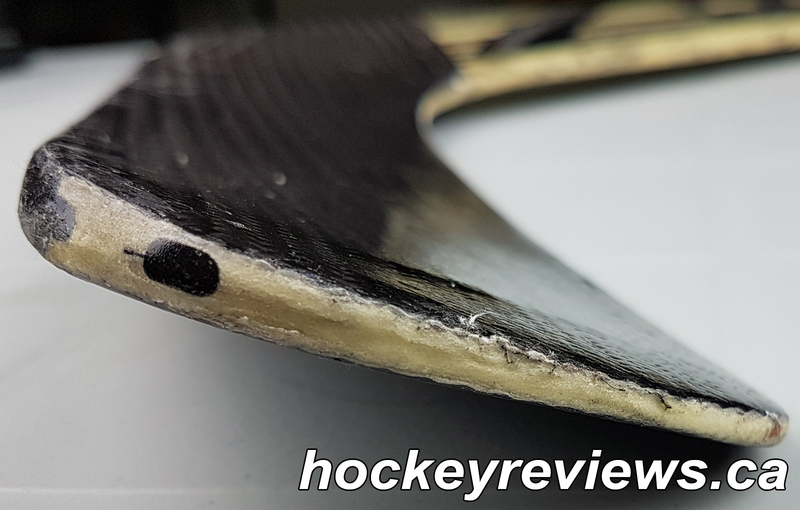 With the added bus bumper material the blade on the Infinity Exosphere was the piece of the stick I was most interested in, since the majority of my durability issues with sticks in the past has been on the bottom of the blade and starting at the heel. I believe the heel spends the most time of the blade on the ice, and it usually shows with premature wear of the exposed inner foams breaking down. The bus bumper material is supposed to remedy this issue and so far seems to do just that. Along the blade and toe there is no visible signs of wear and I can’t feel any while running my fingers along the edge. There is some wear on the heel of the stick however, a very small section of the bus bumper material is chipping off, but even after peeling it away there is more bus bumper material covering the inner urethane core. Besides that very small piece the rest of the bus bumper material is feels and looks brand new. There is some chipping and wear with the outer carbon wrap which shows in the exposed white weave material showing beneath the carbon weave. Running your fingers along this edge will pull up some of the white weave and carbon wrap leading me to believe this damage could get worse in the future but I do not believe the integrity or strength of the blade has been negatively affected so far. I do perhaps wish the bus bumper material wrapped around on the outside of the carbon weave, but that might not be possible to do from a construction standpoint. The top of the blade which connects to the paddle is another area that has shown some wear with chipping of the carbon wrap, to the point that a small piece has completely come off. 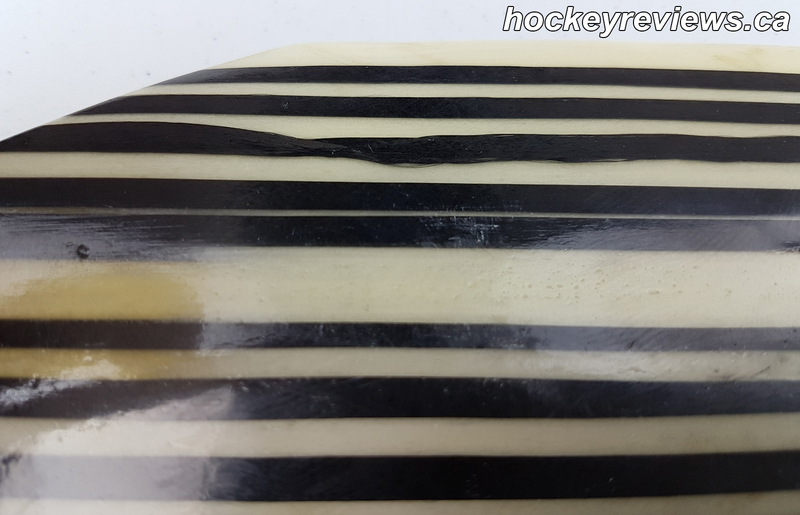 This area tends to be a high impact area for me where pucks usually significantly dent this edge on the top of the blade. While the Infinity Exosphere shows denting in this area it has held up well overall, but it does feel like the urethane foam core has been exposed here. This is an area I wish was also covered with the bus bumper material for extra reinforcement. The face of the blade feels perfectly intact on the front and back sides with no cracks or visible signs of damage or weakness.